Have you ever visited your GP or A&E, been in excruciating pain that your doctor agrees is awful and which will definitely get worse without any urgent advice or treatment? I must confess this has happened to me on numerous occasions as I’ve suffered broken bones, many slipped discs and a ruptured disc in my back – which was definitely off the 1-10 pain scale! – and had me shuffling slowly and painfully with sweat dripping off me until I’d been operated on. On those and other occasions, which I won’t bore you with, when I suffered physical health problems I found the response of doctors and other healthcare practitioners to be pretty responsive, compassionate and keen to do something about the problem quickly. But what a shock I had when faced with mental ill health 16 years ago and was diagnosed with severe clinical depression. I had subsequent recurring major episodes that endured for more than ten years. I now know I was ‘lucky’ to even get diagnosed and I have a GP to thank for that, who knew me well. I was also ‘lucky’ in being able to access psychological therapies and ‘only’ having to wait five months for that. But I wasn’t so lucky in the following years when these episodes reoccurred or I hit crisis points. I discovered that services had been restructured since the last time I’d needed help, so the phone number I’d been given to call had been changed or someone had left. Trying to navigate NHS structural and administrative changes when you’re feeling very ill is pretty difficult when you’re physically ill, but is almost impossible when mentally unwell. Recovery for me was a slow and painful process, and I couldn’t have done it without professional help, medication, expert advice, mindfulness meditation and a strong support base of friends. “between 4,000 and 4,500 people take their own lives in England each year”. The report goes on to say that currently, “referrals to mental health services continue to increase. Monthly referrals to community mental health teams were up 13 per cent in 2013, and up 16 per cent for crisis services”. But money for mental health services has fallen in real terms. 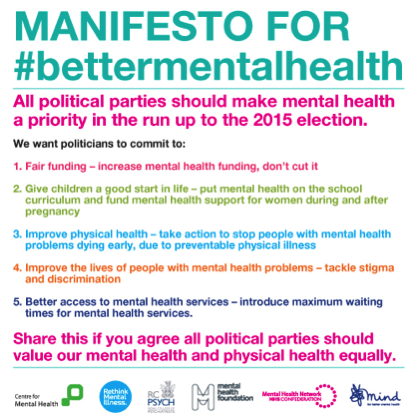 I fully support the manifesto and the organisations who have come together to try to exert some influence in the mental health world and really hope that it is an additional lever to get some much needed improvements in mental health across the country. I find it shocking that in 2014 mental health is treated differently to physical health and that access to the scarce range of treatments available is so poor. When I had broken bones I wasn’t asked to go home and wait for a number of months or years and then go back for treatment. So why is it OK for someone with a severe mental health problem to be told to do just that? I’ve never heard of anyone who was suffering from a life threatening physical problem, say a heart attack, who was locked up in police cell for safety because there was no medical help available? Yet that happens frequently for people who are suicidal and in fact the police are often the only emergency service who offer help – so I’m not knocking them, just pointing out how truly shocking this is. But what is more shocking to me is that we tolerate this state of affairs, as it has become the norm. While the Parity of Esteem call to action by NHS England is welcome, I fear it will remain an aspiration that is never realised. Well, I think a seismic shift is urgently needed in commitment, funding and attitude to make any appreciable change in mental healthcare, which includes research, treatments and interdependencies with physical health. This shift needs clear leadership at national, regional and local levels spanning government, NHS Commissioners, providers and the third sector. No huge reviews need doing – just listen to the people who currently work flat-out in NHS mental health services and they will explain what’s needed. Listen to charities such as Mind and Rethink, who do magnificent work helping people who are left without any access to treatments but have life-changing and life-limiting conditions. Listen to the people who have lived life experience of mental health problems. Recovery is possible but many people never get the chance to find out. Any new investment needs to be additional, designated finance and not become a contest for short-changing any other existing area of care. Tolerating the norm is no longer an option – people’s health, quality of life and futures depend on the shift being made – and made quickly. For further reading and evidence I recommend the report by the Royal College of Psychiatrists from March 2013- Whole-person care: From rhetoric to reality – Achieving parity between mental and physical health.